Grouting has now become simple!!! Put away your shovels and your buckets, the GROUT GRUNT™ effectively and efficiently place mixed grout, or any other high density material in CMU 50% faster than conventional methods. And it’s much cleaner. Made from injected, molded, high-density plastic, the GROUT GRUNT™ will withstand your toughest jobs. Lightweight design holds up to 50 pounds. Excellent for low-lift grouting, no pump set-up, hoses or clean-up. Great for extended-set grout, mortar, pea stone, sand and water. The safer way to hand deliver grout – faster and easier! Saves time (up to 50% faster) – makes money! Designed for the user – ergonomically friendly! Grout cleaner – no more stains on walls! Designed BY a mason for a mason! Around the home, around the yard, around the farm, or around the workplace, use the GROUT GRUNT™ products any time you need to transfer loose material the easy way. 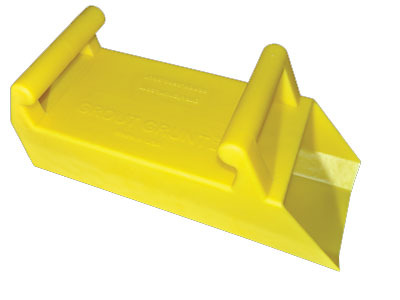 Grout Grunt™ weighs under 3 pounds empty and holds up to 0.5 cubic feet of material with each scoop. The new, improved Grout Grunt II weighs just 2 pounds empty and holds up to 15% more. 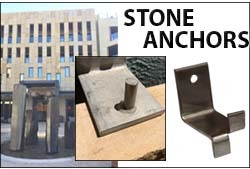 Also performs as a large-volume water bailer for basements, boats and more. Farm, Zoo, Livestock and Pet Owners: Makes feeding and watering less labor intensive. Bulk Material Handling: Better than buckets! Recreational Use: Out-digs toy-size scoops for the beach, sandbox and more!